In this frightening picture, Tirew braves trees that appear to be alive and not really made out of wood. @jennifer. Yep, but where in? :D Boo!! did I make him jump? Oh.. what's that grabbing the back of your shirt! I'm a destro player so my experience of the order side of chaos wastes is not all that great, but i'm gonna take a stab & guess its north of the Kaltenbach Expedition. Answer up! I need to give better hints. 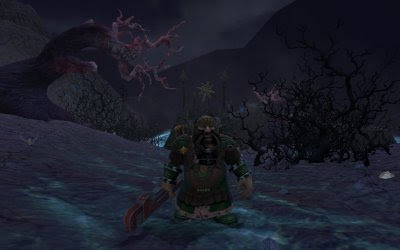 I'm having a hard time focusing on the environment when I see a juicy dwarf target that needs a-killin.